Engineering 3D Tissue Test Systems provides an introduction to, and unique coverage of, a rapidly evolving area in biomaterials engineering. It reveals the current and future research responses, the current and future diagnostic applications, and provides a comprehensive overview to foster innovation. It offers insight into the importance of 3D systems and their use as benchtop models, spanning applications from basic scientific research to clinical diagnostics. Methods and limitations of building 3D tissue structures are evaluated, with attention given to the cellular, polymeric, and fabrication instrumentation components. The book covers the important aspects of polymeric tissue test systems, highlighting the needs and constraints of the industry, and includes a chapter on regulatory and pricing issues. Karen J. L. Burg earned a B.S. in chemical engineering with a minor in biochemical engineering from North Carolina State University, an M.S. in bioengineering from Clemson University, and a Ph.D. in bioengineering with a minor in experimental statistics from Clemson University. She completed a tissue engineering postdoctoral research fellowship at Carolinas Medical Center in Charlotte, North Carolina, later serving as Clemson University Interim Vice Provost for Research & Innovation, Clemson University Interim Vice Provost and Dean of the Graduate School, and Kansas State University Vice President for Research. She is currently Harbor Lights Endowed Chair of Small Animal Medicine and Surgery at the University of Georgia and Hunter Endowed Chair Emerita at Clemson University. Karen is a past President of the Society For Biomaterials and past member of the Tissue Engineering and Regenerative Medicine International Society North American Council. She currently serves as a member of the Board of Directors for the National Academy of Inventors as well as a member of the College of Fellows Executive Board for the American Council on Education. Honors to Dr. Burg include the 2001 National Science Foundation Faculty Early Career Award, 2001 Presidential Early Career Award for Scientists and Engineers; she is an American Council on Education Fellow, a Fellow of the American Institute for Medical and Biological Engineering, a Fellow of the Biomedical Engineering Society, a Fellow of the National Academy of Inventors, and a Fellow of the International Union of Societies for Biomaterials Science and Engineering. Didier Dréau earned a B.S. in physiology and cell biology from Rennes I University (Rennes, France), an M.S. in Molecular and Cell Biology from Blaise Pascal University (Clermont-Ferrand, France) and a Ph.D. in Biochemistry, Molecular and Cell Biology with emphasis on Immunology from the Ecole Nationale Supérieure Agronomique (ENSA) de Rennes (France). Following his post-doctoral training in immunology and immunotherapy and serving as Research Scientist at Carolinas Medical Center, Dr. Dréau currently is an Associate Professor of Biology at the University of North Carolina at Charlotte. Dr. Dréau also serves as the Honors in Biological Sciences Program Director in the Department of Biological Sciences, and the Area Leader for the Applied Cancer Technology and Therapeutics in the Center for Biomedical Engineering and Science at the University of North Carolina at Charlotte. In addition to his teaching of cancer biology and physiology, Dr. Dréau, a member of the American Association for Cancer Research, serves on multiple granting agency review panels along with scientific journal editorial boards. Timothy Burg earned a B.S. in Electrical Engineering from the University of Cincinnati and an M.S. and Ph.D. in electrical engineering from Clemson University. He is currently Professor of Veterinary Biosciences & Diagnostic Imaging in the University of Georgia College of Veterinary Medicine and Director of the University of Georgia Office of Science, Technology, Engineering and Mathematics Education. Dr. Burg has extensive experience in industrial applications of robotics and nonlinear control design tools and the academic investigation of the basis and future directions of these techniques. Dr. Burg is working with students and other collaborators to build a unique biofabrication system that assembles tissues in an assembly line fashion. One component of this system, a bio-printer that uses ink-jet printing to place living cells, was developed during an US National Science Foundation grant. Dr. Burg strives to connect the exciting research at the university level with K-12 students. "Engineering 3D Tissue Test Systems is a comprehensive book that covers the areas of biofabrication, materials, and biology for engineering 3D tissues. Readers can gain tremendous amounts of knowledge on 3D printing, biofabrication, model systems, and test methods from this book. I would definitely recommend this book to my colleagues and students." "…an excellent asset for those seeking knowledge on the creation of 3D cell culture systems and their potential to improve our understanding of human biology." "This book provides comprehensive materials needed for the readers to understand the concept of engineering 3D tissue test systems. It provides a good balance of basic sciences and engineering principles. It also includes a good amount of clinical relevant applications of such systems to provide practical value to its readers. 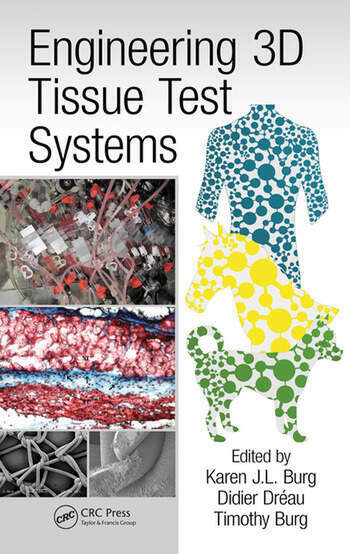 Overall, this is a great introductory book for graduate students and researchers who want to explore more in the area of 3D tissue test systems and their applications." "…provides a clear presentation of design considerations from the ground up, and could be considered a short course in popular topics for 3D cell culture. The addition of a section relating to business considerations was novel and an excellent primer towards moving these needed technologies into broader adoption, where the impact of 3D cell culture can be realized." "… an excellent resource for undergraduate students and for those just entering the field. The inclusion of several chapters dedicated to the fundamentals of different aspects of biofabrication followed by chapters with examples illustrating these fundamentals is an approach that will help novices to better understand the principles. However, the book is also a good read for more established investigators as a reminder of where we have come and where we are going regarding cellseeded scaffolds and regenerative medicine."